Expert insights into who leaves college with the most debt. Newspaper headlines suggest that many students graduate from college with hundreds of thousands of dollars in student loan debt. But is this really the case? A report, Who Graduates College with Six-Figure Student Loan Debt?, finds that only 0.2% of undergraduate students and 6.4% of graduate students graduated with $100,000 or more in student loans in 2007-08. Far from being the 99-percenters, these students are among the 1-percenters when it comes to student loan debt. Graduate and professional students are more likely than undergraduate students to graduate with six-figure student loan debt. Among students graduating with six-figure student loan debt, 10% were undergraduate students and 90% were graduate and professional students. More than a third of law school graduates and almost half of medical school graduates graduated with six-figure student loan debt. Excessive student loan debt does not appear to be due to parents being unable or unwilling to help pay for college. Among undergraduate students who graduated with six-figure student loan debt, more than half had parents borrowing from the Parent PLUS loan program, with an average parent PLUS loan debt of about $50,000. Some parents even borrowed more than $100,000 in Parent PLUS loans on top of the student's six-figure student loan debt. So what seems to cause undergraduate students to graduate with enormous debt, other than a lack of awareness or caution? Students graduating from more expensive colleges are more likely to graduate with six-figure student loan debt. More than half of undergraduate students who graduate with six-figure student loan debt attended the most selective colleges and universities. Nearly three-quarters of undergraduate students graduating with six-figure student loan debt graduated from non-profit colleges, compared with almost a quarter graduating from public colleges and less than 3% from for-profit colleges. If the net price of a college represents more than 18% of total family income, the student is four times as likely to graduate with six-figure student loan debt. Undergraduate students who graduate with six-figure student loan debt must necessarily borrow from private student loan programs, since the federal Stafford loan limits are not enough. But even among graduate students, who are eligible for the Grad PLUS loan, students who borrow from private student loan programs are more likely to graduate with six-figure student loan debt. Some majors are more likely to graduate with six-figure student loan debt and some majors are less likely. In particular, undergraduate students majoring in theology, architecture and history are much more likely to graduate with excessive debt and undergraduate students majoring in computer science, mathematics and health care are less likely to graduate with excessive debt. Unfortunately, the students who will be least able to repay their student loans are also the ones who are most likely to graduate with too much debt. Education debt may be good debt because it is an investment in your future. But too much of a good thing can hurt you. Keep your student loans in sync with your income after graduation. 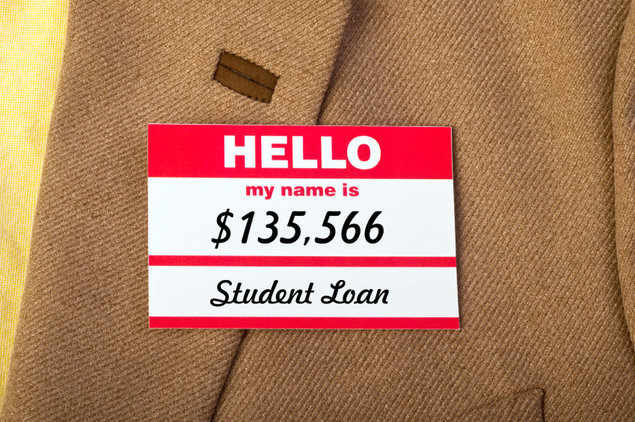 Do not borrow more for your college education than your expected annual starting salary. If your total student loan debt is less than your annual income, you'll be able to repay your student loans in 10 years. If your debt exceeds your annual income, you will struggle to repay your student loans and will have to use alternate repayment plans like extended repayment or income-based repayment to afford the monthly loan payments. But this means you will still be repaying your own student loans when your children enroll in college. The report makes several recommendations for addressing the student debt problem, such as clarifying the difference between loans and grants in college financial aid award letters, providing free financial literacy training for students (and parents), better tracking of student loan statistics by the federal government, increasing government grant funding, allowing federal and private student loans to be discharged in bankruptcy, and setting student loan limits based on estimates of annual starting salaries after graduation.